I am awful at keeping up with my fitness. I don't like a lot of exercise and I can't afford the gym. I also find every excuse possible to not do something. That said, I can get on top of it sometimes. It takes a lot but I like having things to motivate me. I like having new workout clothes, a role model (which I'm in the process of looking for) and there's something I want to do when I reach a certain fitness goal. I've always wanted my belly button pierced but I don't feel like it's something I can do until I have achieved my happy tummy state. I struggle with healthy food too because... well why does bad food taste so good!? 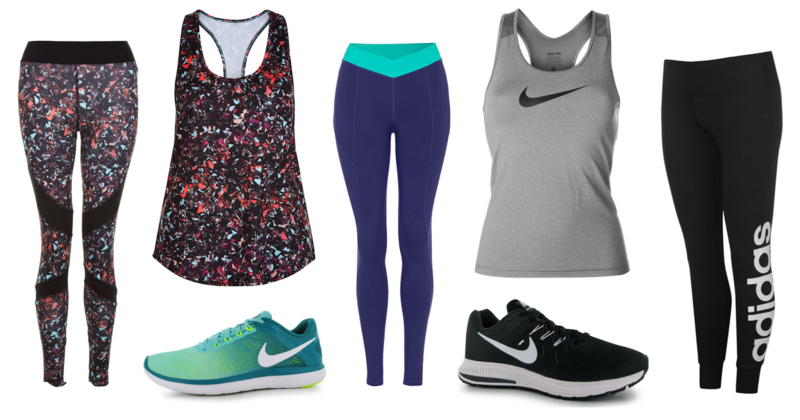 Though I won't be earning much in terms of spending money over the next year, I am wishlisting all the pretty workout gear though I'll most probably never buy it. There's so many lovely workout clothes at the moment that I'd love and these are just a few of them. I love the black, white and grey workout gear from well known brands and I am loving some of the prints available in high street fashion's work out collections. Alas, I need to get motivated again despite not being able to get any new workout wear. Does anyone have any tips on how to get motivated or anything on how to get started with a fitter and healthier lifestyle? It would be much appreciated! Some cute picks here. Loving the trainers. I know how you feel with the non motivated thing. But, I try and motivate myself by reading blogs on motivation, fitness workouts, how to get fit posts etc. Even Pinterest I like to use for looking for different recipes that are healthy and different workouts to try out to see which ones I prefer.